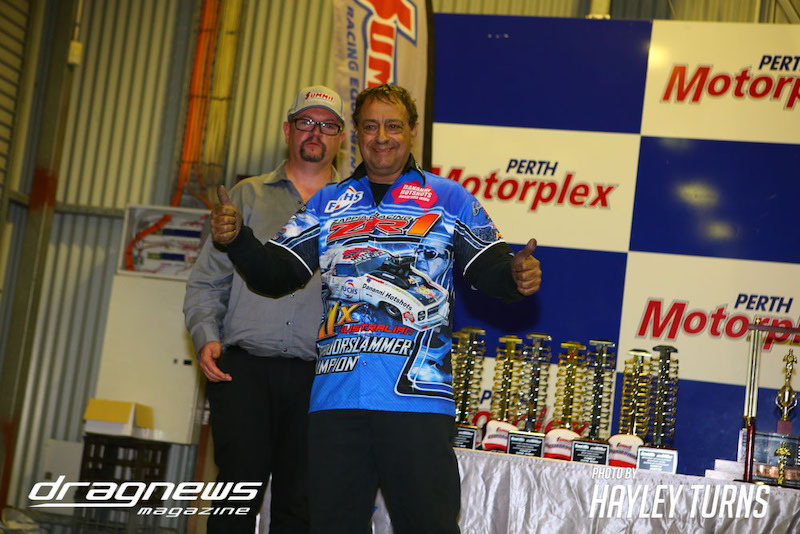 John Zappia’s new Noonan engine combination paid off immediately at Perth Motorplex on Sunday as he wrapped up the win in the Summer Slam bracket as part of the ANDRA Grand Finals. 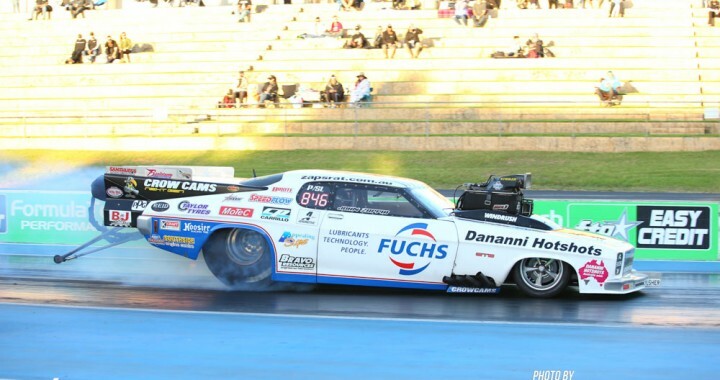 Zappia’s Fuchs/Dananni Hotshots Monaro qualified second with a safe 5.770, before stepping up for a 5.724 win against Frank Taylor in the elimination round and then a 5.760 pass to win the final, after opponent Daniel Gregorini left before the green light with a mechanical issue. 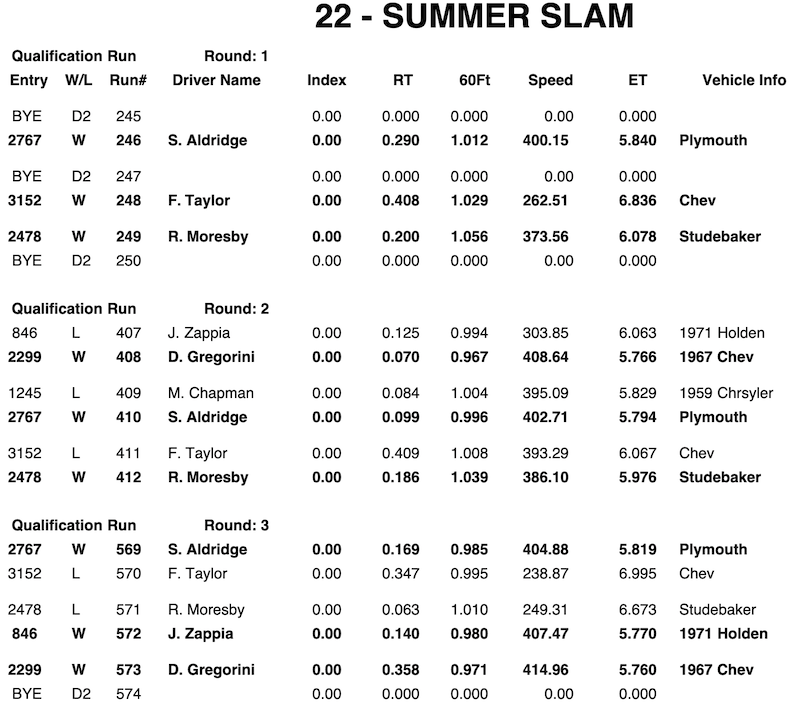 Zappia finished second for the Summer Slam championship overall, despite missing two events of the seven round series. He made the final of every event he attended and won three of those five finals. 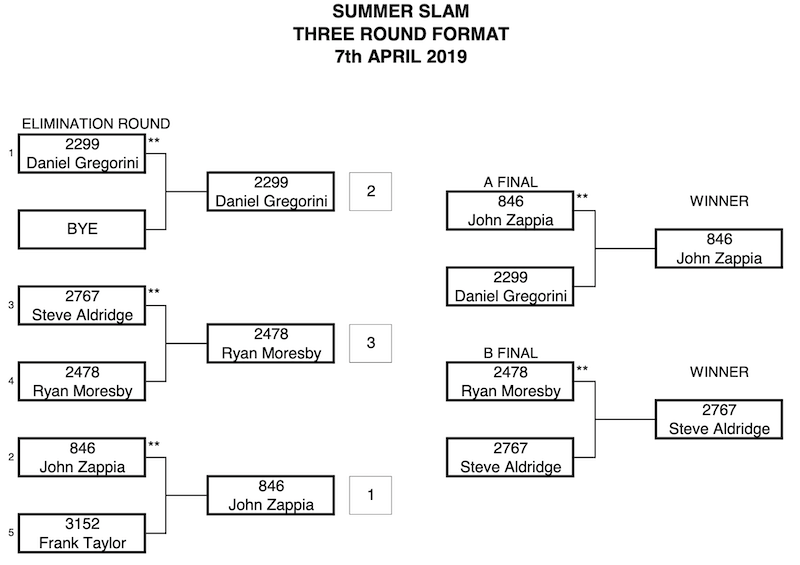 In fact, Zappia has made the final round of every single Summer Slam event he has attended since the series begin in 2016 – thirteen in total. “The national series was our priority if there was a clash of dates with the Summer Slam series we opted for the national series. 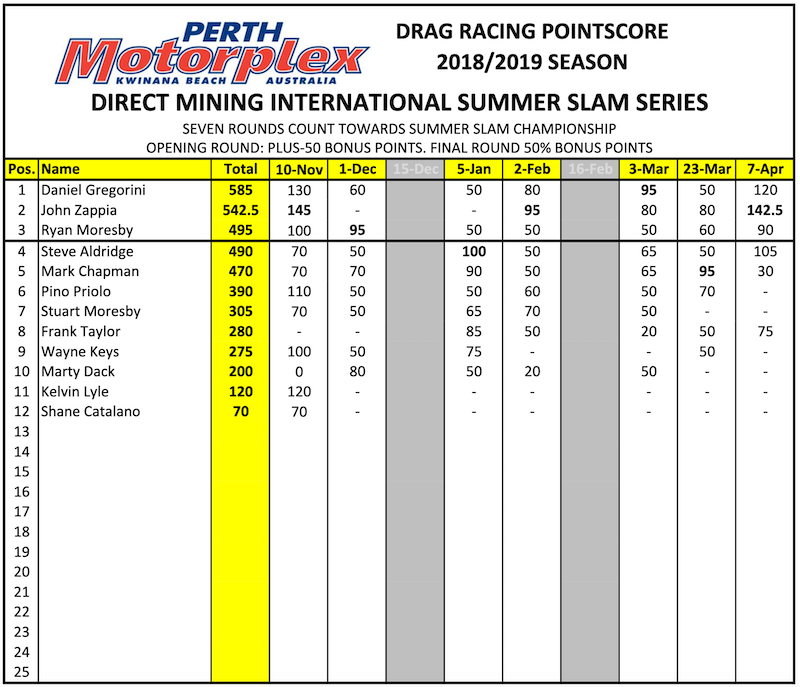 The Summer Slam series has been a great initiative in Perth thanks to Kelvin Lyle and his company Direct Mining and Industrial for sponsoring the series and hopefully it will be bigger and better next season” he said. After a 1000 feet shut off pass to perform a systems check on his first qualifying run, Zappia returned for a 5.77, where he battled tyre shake in what has been a constant theme for the team at Perth Motorplex this season. “With the ANDRA Grand Finals being a two day event, we did our maintenance overnight and were able to go over everything closely for race day where we were due to take on Frank Taylor. 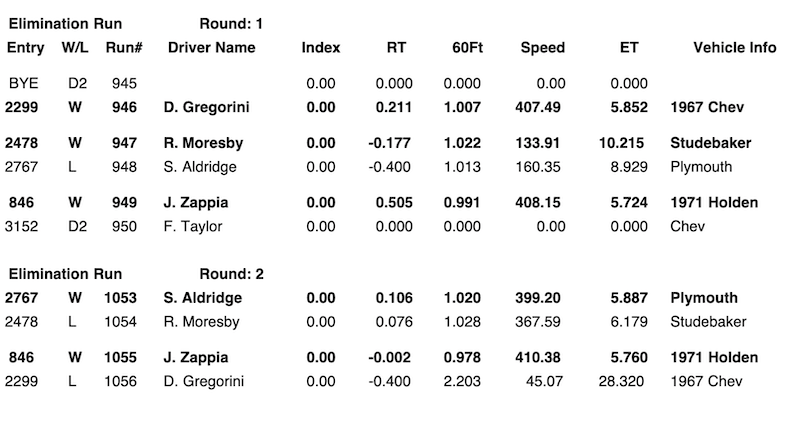 The impressive run secured a finals spot for Zappia, where he would take on Daniel Gregorini. Zappia said the team was taking a conservative approach with a new engine, though the track and air conditions were outstanding. “There was 5.60 potential in that air and we are starting to figure out how to make it go through without shaking. We’ve struggled at Kwinana with tyre shake but showed a lot of improvement in eliminating the tyre shake issue we have had,” he said. With the Perth season now at a close, Zappia Racing will focus on the 400 Thunder Professional Drag Racing Series, where Pro Slammers will next compete at Sydney Dragway for Nitro Thunder on the 3 – 4th of May. Posted in Perth Motorplex Meetings, Slamfest Series.